Flagstone is a unique paving surface that adds a natural look to any patio or walkway. 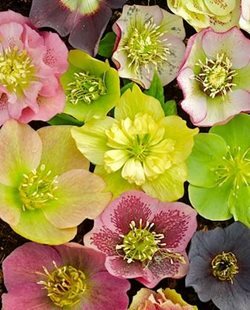 It can be laid on a dry bed of sand and gravel or it can be mortared to an existing concrete slab. There are also three options for filling the joints between flagstones. 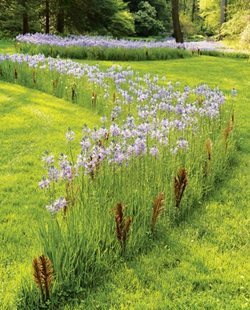 Joints over a dry bed can be filled with sand or can be planted between with groundcover, or can be mortared for a smooth, solid surface. Joints over a concrete base are also typically mortared. 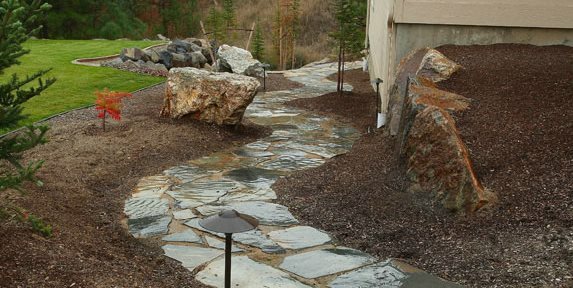 Dry-laid flagstone simply means that the flagstone pieces are placed on a bed of sand and gravel. 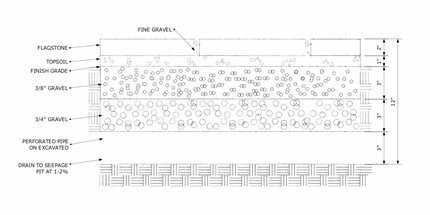 It is recommended that a patio or walkway base be at least 3” deep, then filled with a layer of compacted gravel covered with coarse sand. The flagstones are then placed in the desired pattern, starting at the perimeter and working inward. 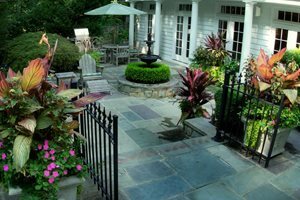 Large stones should be strategically placed at doorway entrances or at the bottom of steps to ensure stability in heavy-trafficked areas. Once the stones are placed, the joints can be filled with sand, planted with groundcover, or mortared. 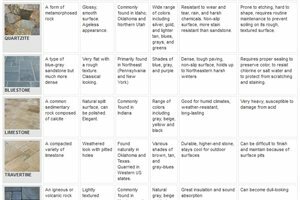 Dry-Laid vs. MortaredClick on the images to download a full-sized PDF. If woolly thyme is used as a groundcover, install the flagstone directly on topsoil with topsoil joints, and plant in the crevices. 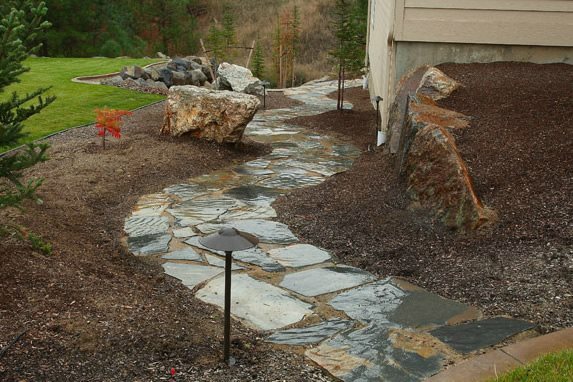 If gravel is used, bed the flagstone on a compacted decomposed granite base and use the gravel of choice in the joints. A polymeric sand can also be used in the joints, depending on the application and desired finish appearance. The average square foot price installed for this method of construction can run as low as $10 per square foot on new construction. 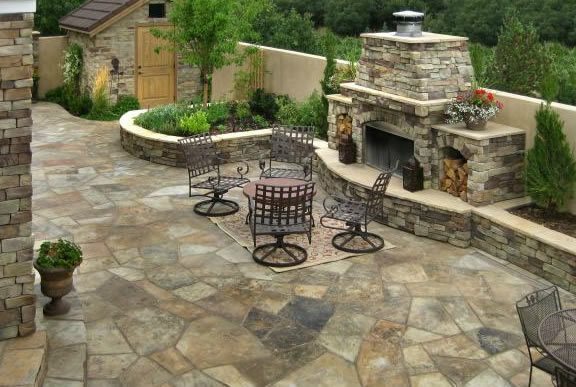 Mortared flagstone is flagstone pieces that have been permanently set with mortar to a prepared subbase. 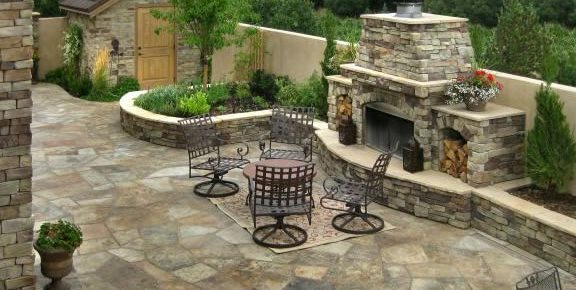 To install flagstone in this method, wet mortar is applied either directly on a subbase of compacted gravel and sand, or to an existing concrete slab. 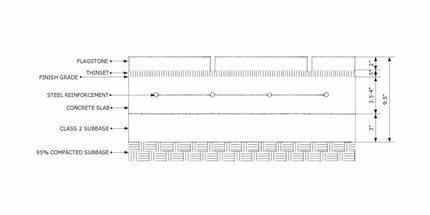 The flagstones are placed in the bed of mortar and then the joints are filled with either sand or additional mortar or colored grout. 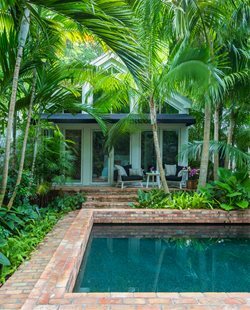 For mortared flagstone, start with a reinforced concrete base that has proper slope for drainage. 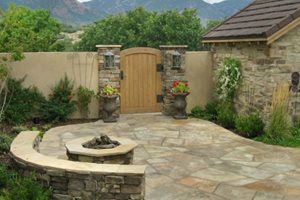 Pressure wash each piece of flagstone to provide a clean surface for a good bond. Each piece is fitted and mortared to the concrete with a mixture of cement, sand, and water. We always use a color additive to the mortar for setting the base and for the grout joints between the stones. We encourage sealing the finished project with either a matte or glossy sealer to prevent water and ice from penetrating the grout joints. The frost can go deep in Colorado Springs, so we recommend a 4” reinforced concrete base that is adequately compacted and sloped. This method of construction is more expensive but also much more durable and attractive. It can range between $20-$30 per square foot on new construction.